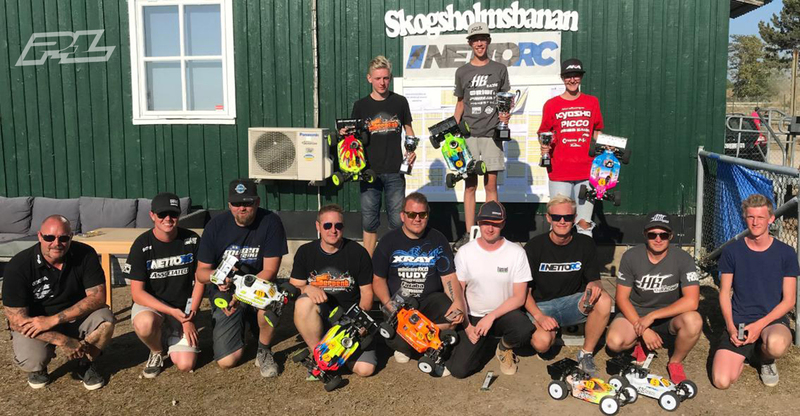 The Swedish Nationals had a new race format for the 2018 season. In the past the Swedish Champion has been crowned in a single event. For 2018 it was changed to a series of 3 races. TMK Raceway Switchblade X2. Smooth edge out, track got quit bumpy, had good traction overall, especially good on the astro. Visby Gotland Switchblade X2. Very high traction on the clay and short haired astro, glued the foams to the wheels for more stability. Skarpnäck Stockholm Lockdown X3. Gambled between X3 & X2, should have chosen X2, tire got soft half way into the A-main. Temperature was below 20, looked to be the same, then the sun came. TMKraceway Tomelilla, Hampus home track, designed and built by Joey the Dirt in 2013. Hampus was one of the favourites to take the 1st round, but the reigning world champion (mentor, friend, team mate) David Ronnefalk was off course the favourite. 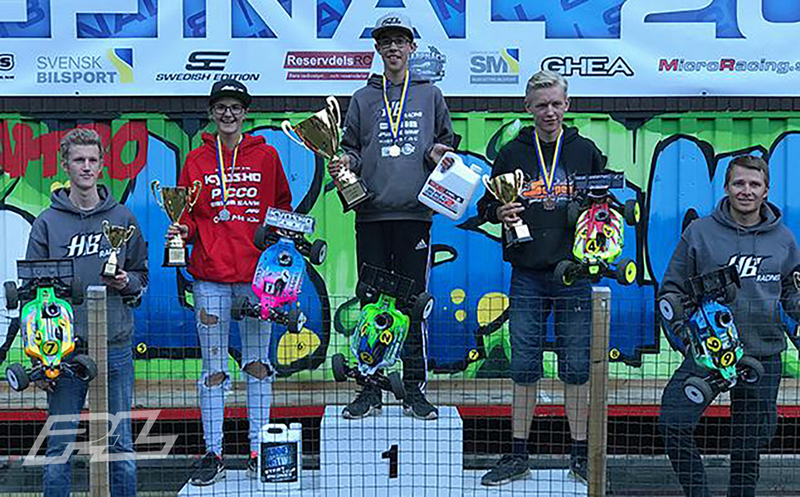 In the qualifying David & Hampus had the same points into the last round, 2 important points at stake for the TQ to bring into the total for the series. Hampus managed to TQ the last round. In the A-main Hampus David & Oskar Levin pulled away from the field, after 30-min Hampus had a lead with about 15 secs to David, but in the pitstop Hampus engine flamed, David just passed when Hampus exit the pits. David managed to build a small gap, but out on the last lap David made a mistake in the whoopie section, car on the roof and Hampus just passed him, wheel to wheel over the finish line Hampus beat his idol at home track. He screamed out his happiness. On top of that Hampus also won the Junior finals. Clean sweep in 1st round. In qualifying Hampus and Elias Johansson had a good fight about the TQ, again it was going to be the 5th round to decide TQ. Hampus had a 2-point lead, but Elias could take it if he TQ last round. Elias did not pull it off so Hampus was overnight TQ for the second time in a row and with 2 more point into the series total. In the A-Main Hampus, Elias & Pontus Larsson pulled away, Elias did some mistakes and dropped down, Hampus built a gap to Pontus. After 20 min Pontus came back strong and managed to pass Hampus out of the pits. Hampus put the heat on Pontus and he made a mistake, then Hampus pulled away and won with 30 secs over Pontus and Jessica 3rd. Finished of with a win in Junior finals again. 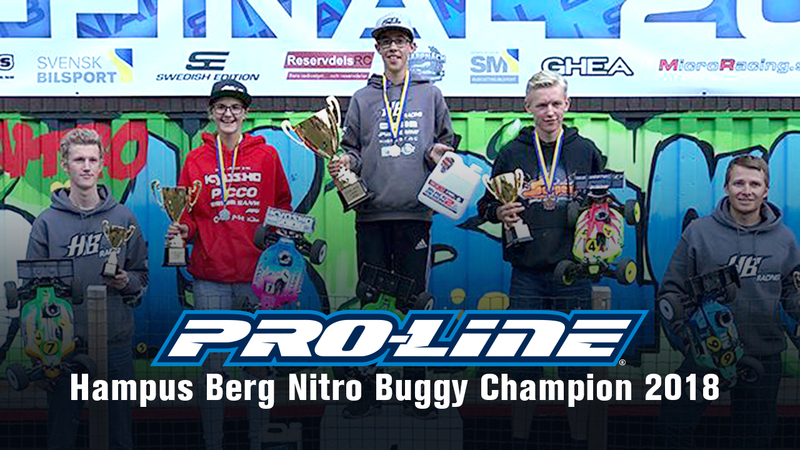 So, with a second clean sweep in a row Hampus took a grip of the Title into last Round. In qualifying Hampus struggled a bit in the first 2 rounds, did not find the proper balance in the car, 9th after 2 rounds. Into Q3 Hampus changed a lot of things to the car, Boom TQ in Q3 and felt way more relaxed in the driving. A small mistake in Q4 was expensive, 3rd place. In Q5 Hampus missed TQ with one sec, Jessica TQ and Hampus second after Qualifying. In the A-main Hampus started second, Jessica & Hampus pulled away from the rest of the field. 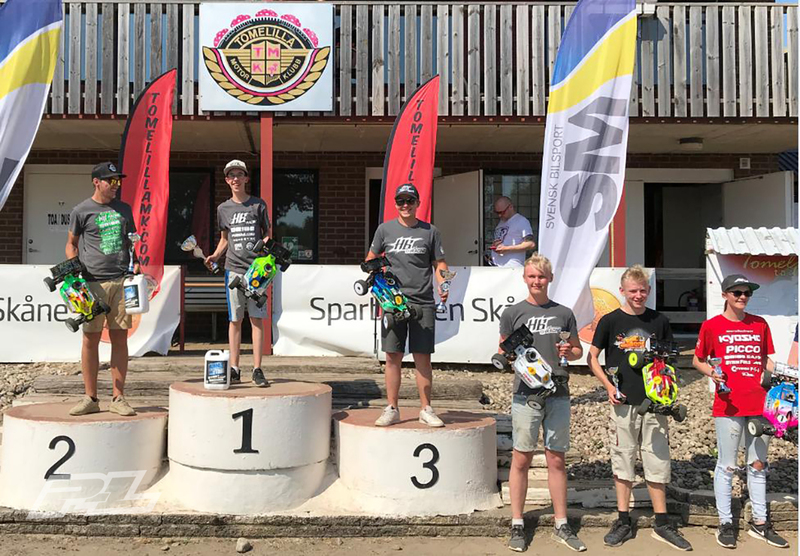 Half way into the main Jessica had an 8 sec lead, Hampus started to gain some ground, then got trouble in passing a backmarker and lost another 5 sec, tried his best to close the gap but pushed to hard and traction rolled. Secured the second place instead. Race 1. Tmk raceway Switchblade X2. Smooth edge out, track got quit bumpy, had good traction overall, especially good on the astro. Race 2. Visby Gotland Switchblade x2. Very high traction on the clay and short haired astro, glued the foams to the wheels for more stability.